Red-headed Woodpecker. At Our Feeder. No, Really! Garrett enjoys whole corn. I knew he would. 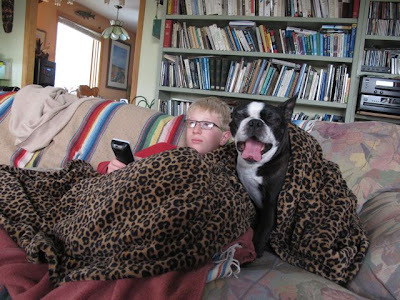 Bill got home late Sunday night and awoke Monday morning to Garrett’s red, white and Superman-hair blue beauty. He and I took photos and reveled in having such a bird—such a BIRD! coming to our very own deck. Phewwwww! He got to see Garrett! And then Bill had to take off again the next day, to meet with optics companies at a hunting trade show in Las Vegas, where they tout the latest weapons and run video loops of “great kills,” which is about as opposite as you can get from staying home in Appalachian Ohio photographing a red-headed woodpecker. What he does to keep a roof over our heads…if you want to kill me, send me to Vegas. The most hostile and forbidding Zick habitat imaginable. As my friend Liz says, "Never been, but I hear there are birds around the edges." Here's Bill getting himself a dose of serenity before he took off again. 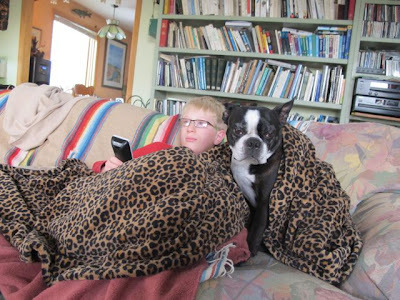 Liam manned his usual station on the living room couch and called us whenever Garrett showed up. Chet Baker, who needs to be swaddled in Polarfleece all winter, found it a bit off-putting, all the attention this fabulous bird was getting. Sorry, Chet, but you're going to have to get used to seeing Mether and Daddeh all preoccupied. 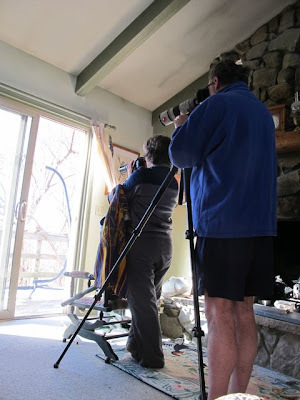 I use our old Scotch rocker, which came over from Scotland with a our late aunt's grandmother and is one of the oldest things in our house, as a sort of blind and monopod, resting my elbows on its back while I hand-hold my camera. Bill gets better shots because he uses a tripod and a better lens. I tell him my shots are good enough for a blog. Garrett is no shrinking violet. 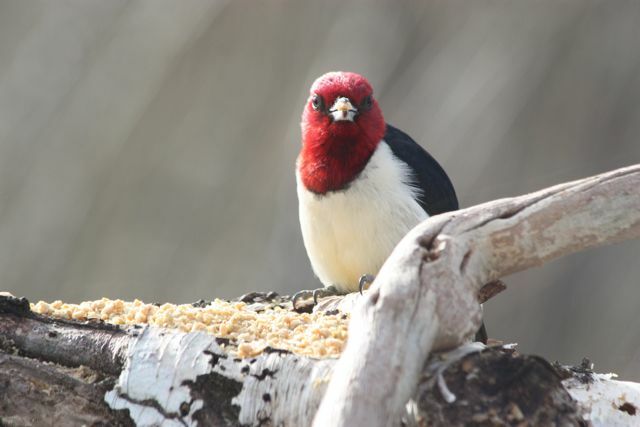 Red-headed woodpeckers are hard-wired to be aggressive. If you think about their plumage, the bird is one big HELLO HERE I AM! 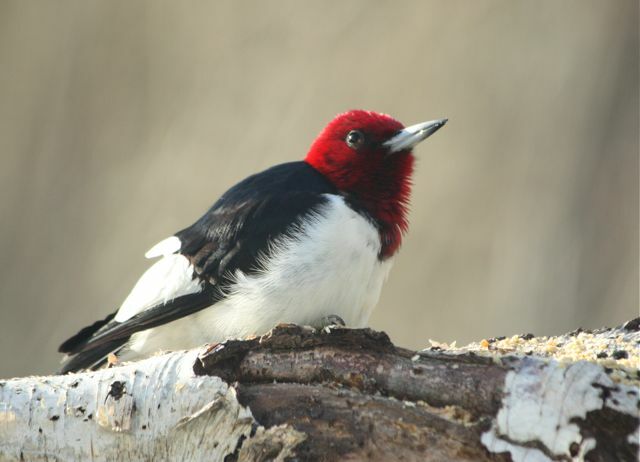 His black and white wings flash in flight; his all-red head is the avian equivalent of warpaint. Plains Indians used the heads of red-headed woodpeckers as battle ornament; it was the Cherokee's talisman of war as well. He’s like Texas toilet paper; he don’t take sh-t off nobody. 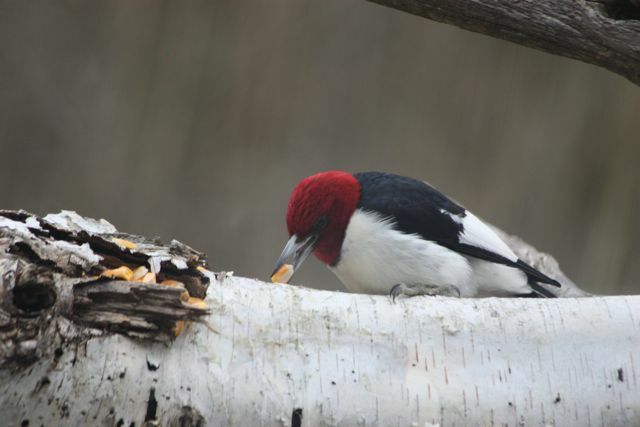 One study of aggressive interactions between red-headed woodpeckers and starlings showed that the woodpeckers initiated 51 of 62 interactions. They are able to successfully defend their nest cavities from takeover by starlings. 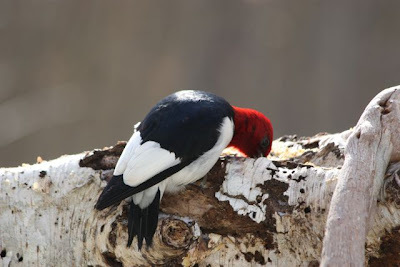 According to the Birds of North America species account, even pileated woodpeckers will defer to red-headed woodpeckers in an argument over a nesting cavity. 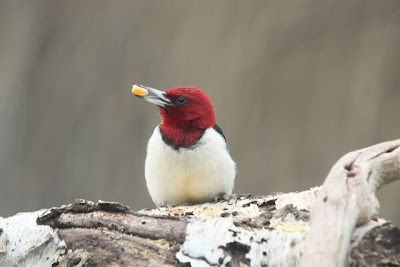 Those poor sweet retiring vanishing flickers should take a page from the red-headed’s book. 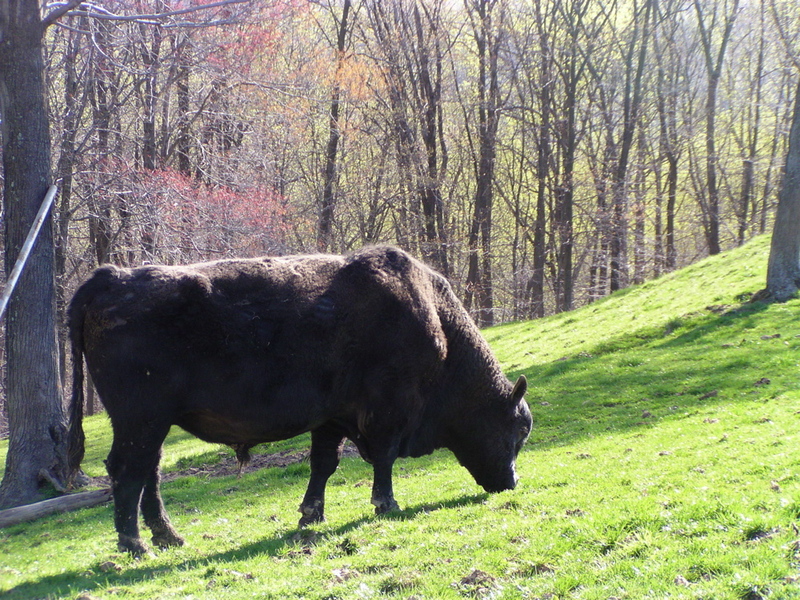 This old photo of Buck the Bull shows the habitat a couple of miles from our home where red-headed woodpeckers used to breed. Habitat like that--with big mature oaks over grass--is hard to find. The habitat is still there, but the birds are inexplicably gone. So why have red-headed woodpeckers become so terribly rare? Well, they need mature oaks and hickories to produce the nut crops they need to survive the winter. And they need those huge trees to be widely spaced with a grassy savanna beneath. Where do you find habitat like that? Around here, hardwood trees like oaks and hickories are never allowed to get huge any more. They’re cut for timber when they’re still teenagers. And what comes in after the big trees are cut is thick young second growth, a habitat the birds can’t use. Red-headed woodpeckers need an open understory because they are primarily insectivores. They catch much of their food on the wing, and they still-hunt like bluebirds do, plunging down into the grass to capture grasshoppers and caterpillars. They’re the most heavily insectivorous of all North American woodpeckers, in fact, which is why they’re also the most strongly migratory—most of them clear out as soon as the insects die back with frost. The Birds of North America species account authors (Kimberly G. Smith et. al.) speculatively link the RHWO's demise to the disappearance and possible extinction of a grasshopper that was formerly abundant in the Midwest. Think about that, and then wonder if man had anything to do with that. I don't tend to wonder long when you're talking about agricultural pesticides and insect abundance. I don’t know where this little fellow (or gal; red-headed woodpeckers are sexually monomorphic) came from, but he dropped out of the sky like a freshly-wrapped present. The weather turned cold right before he appeared, going from the 50’s to daytime highs in the 20’s, and I’m guessing that smoked him out and sent him looking for supplemental food. We were charmed at how readily he inspected our feeders and sampled our offerings. And I was flattered that he likes my cooking best of all. I was so excited all the day he arrived that I was good for nothing but running from window to window shooting photos. When I finally figured out he meant to stay awhile, I worked off my nervous energy making Zick Dough. Eight batches of Zick Dough, eight large peanut jars full. It’ll go fast in this weather. I so want him to stay. Eight batches worth, I want him to stay. The next morning he came in around 8:30. I hollered to Bill; he got a bunch of nice photos; we marveled and for the rest of the day I looked out the windows about twice a minute. Got some nice photos, too, especially when it warmed up a bit and I could throw open the glass sliders and shoot through clear morning air instead of double-pane glass. 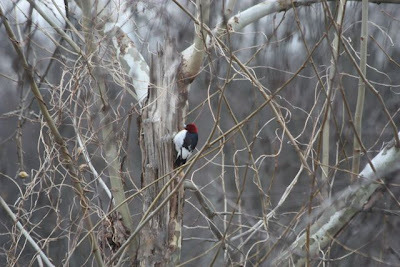 Phoebe and Liam and I went on our run and she pointed out a diving pileated, and that made it a six-woodpecker day for me: red-headed, yellow-shafted flicker, hairy, downy and redbellied being the other five. I’d like to buy a sapsucker, Pat. We robbed the neighbor’s deer feeder of some of its whole corn, and I brought a pocketful home. Not five minutes passed before Garrett had found it and was stuffing corn into the rotty bits of our young sycamore that lost its top in a windstorm fall before last. He looks like he means to stay, and that makes us very, very happy. Love the living room blind. Got a sorta CetaceAvian thing going on over at PF that you might enjoy. Also, Mom finished "Letters From Eden" and loved it. She keeps telling me neat things she learned about this or that (bullfrogs eating hummers for instance). You can bet I will be ordering BBE for Mother's day. In the past, we would have one or more pass through our woods that surround our house but they would never stay long. This year we have had three hang around for the last three months. 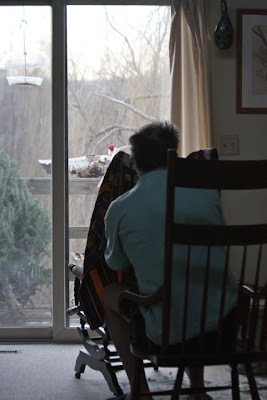 I watch them from the kitchen window early in the morning attempt to knock the squirrels off the limbs as the latter scurry to wherever squirrels go at that hour. Free entertainment for all! I love that FC's mom just finished reading "Letters From Eden"-- so did my mom. What a wonderful coincidence. Also love that woodpecker. That's one gorgeous bird. What a striking bird he/she is! Won't see any in the suburban DC area, I'm sure. Though, we did have a pileated pair here for a number of years, then came Hurricane Irene and knocked down around 75 trees in my little town of Takoma Park. No more pileateds. Have a number of red bellied and I'm always calling out to them to "cowboy up!" They are the most spookable birds! I just don't get it with their large size and large bill. House Sparrows spook them for cryin out loud! That is one beautiful bird! You got some great shots of him. I've only seen them once in Atlanta, high up in the trees. Love the woodpecker, but what really impresses me is Bill's legs! LOL! Birding in shorts and air conditioning sounds nice! Full points for style. That's a mighty handsome bird; I hope he sticks around for a while. We have slightly loopy Ring-Necked Duck living near us in Phoenix. He decided to endure the 120 degree summer in a little pond instead of heading north like the rest. I think it fried his brain a little bit, but that makes him all the more adorable. His name is Gary. I'm looking forward to following this saga. I can tell already it won't be as disappointing at the Star Wars addenda and other sagas. These are the most beautiful birds sitting still and on the wing. You have a perfect place to take their photo. Frankly, I think he was posing for you. He knows how beautiful he is. I think mine were attracted by the suet feeders that year. Thanks for the terrific post. That's a beautiful bird. You make good points about the loss of habitat and pesticide use. I hope Garret stays around for you! It sounds like you're treating him right! We're loving the stories about Garrett. What a handsome bird he is! Have only ever once seen a RHWP, in a boggy lake area in southern IL a year or so ago. I believe it was late summer and he was high on an old dead tree busily collecting bugs and such from the rotting wood. We just couldn't get close enough. Thanks for bringing this one in reach.